Shur’t Shirt Sale: Free Shipping! Just in time for t he early holiday shoppers is our free shipping for two weeks sale on all clothing and items sold through the Shur’tugal store. We have a number of great Inheritance Cycle and Shur’tugal related merchandise on sale through the store, including shirts, hoodies, and pins, all available at low prices until the holidays hit. Purchase items from our store over the next two weeks and your shipping is free — just use the code SHOPEARLYUS at check-out! Be sure to check out or two new designs — the “Beware of Ferrets” design and our “Avoid Roasted Cabbage” design, both inspired by Angela the herbalist. We’ll be adding more exciting designs throughout November, so keep checking back! 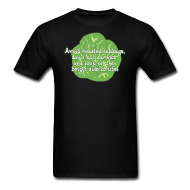 Visit the Shur’tugal and Inheritance Merchandise Store!